Correct response: Who is Andrew? There are many sources, including the BBC, who refer to Andrew as Christ’s first disciple; many Orthodox Catholics also use the Greek term “protokletos”, or first-called, to refer to Andrew. The entryway for the more secular among us: Knowing that St. Andrew’s Day is November 30 (especially for those who know that Scotland’s patron saint is Andrew) and that modern “Advent calendars” usually start on December 1. 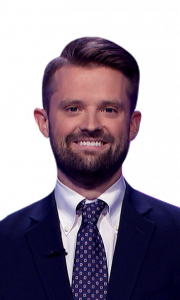 15 Comments on "Today’s Final Jeopardy – November 29, 2018"
Will they/did they announce Phil’s occupation as stated above or did they shorten it to service technician? Phil was announced as a portable restroom service technician from Hammond, Indiana. Alex talked to Phil about it during the chat and Phil gets special access to events like Lallapalooza. Really wish they would avoid religion in a Final Jeopardy clue. This one may be something all Catholics know, but Jews, Muslims, agnostics/atheists, and a lot of Protestants wouldn’t have a chance. 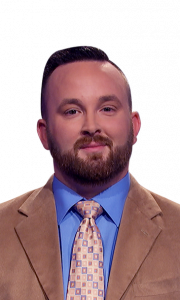 We often see religion related clues in the first two rounds, but the contestants can choose to ring in or not. Something related to a particular religion just seems unfair in Final Jeopardy where people have to try to answer. And, yet, I’ve been to less than a dozen church services in my life and I got this Final Jeopardy just by knowing when St. Andrew’s Day is and seeing Advent calendars in stores all my life. If we’d follow this logic, we’d have to leave out a lot of ethnic or cultural history too, since that could favor certain contestants. Almost any category favors certain groups over others. Right, no one knows everything. Why single out any religion for being taboo subject matter for Final Jeopardy? I like to read about lots of things, including various religions, and I’m definitely not religious myself. Knowledge is power. Not only that, but how many times have we seen a question about a state come up with a contestant from that state? Or a category that meshes with a contestant’s occupation (a theater manager getting a Broadway question, for example). Or Alex chiding a contestant from Canada about making sure not to miss a question about Canada? Random chance and luck of the draw are just that, and that’s how the game goes sometime. Andy, Did you forget to update Adriana’s probabilities above? 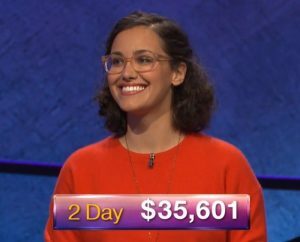 It still shows her chance of winning 2 games, which she did as of today. Should be updated now. Thanks! I thought Jesus picked Andrew and Simon Peter at the same time while they were both fishing. St. Peter’s feast day is in June. I agree with Robert. The bulk of religious knowledge comes from attending religious school during childhood, and thereby gives an advantage to religious/ethnic groups, as opposed to learning by more general means such as formal education or reading. I wouldn’t compare it to subjects like African American History, for example, as people don’t attend special schools for eight or ten years to learn about their ethnic backgrounds. Though there might be a slight advantage for members of those groups, it’s still knowledge that can be picked up through more conventional methods. Just like being a woman wouldn’t give me a huge edge over a man in a Women’s History category. 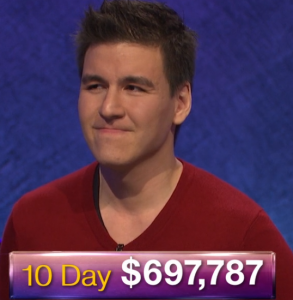 The wording on Final Jeopardy was misleading. The clue should have referred to Andrew as the first “disciple”, not the first “apostle”. Disciples and apostles are not the same thing. There were many disciples of Christ (Andrew noted as the first) but only 12 apostles were later chosen and Andrew is not listed first in the gospel accounts of the choosing of the 12 apostles. This clue is unfair to Non-Catholics that are not familiar with the Advent Calendar but are familiar with the actual Bible record. The clue was not misleading. 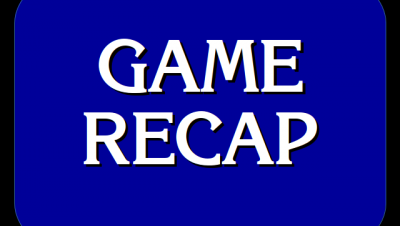 The category was CATHOLICISM and not THE BIBLE. Scripture and Catholic tradition can sometimes differ. The 3rd place contestant should have bet $0 and this is not hindsight. When the 3 scores are that close, the one in 3rd should bet as little as possible to ensure a win if the other 2 miss. He would need the other 2 to miss almost no matter what so why have the pressure of trying to be correct. It’s one more less variable. For the record, I am Catholic and would have said Peter. I think the only feast days I know are for St. Patrick and St. Nicholas.